Sgt. 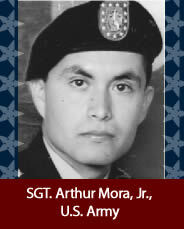 Arthur Mora, Jr., US Army, age 23, of Pico Rivera, Calif., died Oct. 19, 2005, when his Humvee was struck by indirect enemy fire during patrol operations in Balad, Iraq. He was assigned to the to the 5th Squadron, 7th Cavalry Regiment, 1st Brigade Combat Team, 3rd Infantry Division, Fort Stewart, Ga.